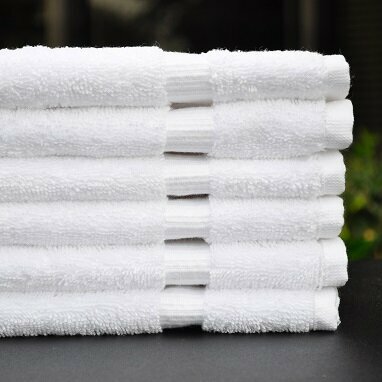 Wholesale white hand towels 16x30(3.8Lb) heavy quality for use in Salons, Gyms, Spas, Hotels and many more businesses. The car wash industry may be one of the most lucrative, as vehicle owners spend several billion collectively each year to keep their automobiles, trucks, SUVs, minivans and hybrids spotless. Of course, to build relationships and ensure repeat business, you must have the right towels at your facility. Car washes around the nation trust Towel Super Center for wholesale white hand towels that scrub, rub, polish and shine. Our premium 16” by 30” white hand towels are made from 100 percent cotton fibers, allowing you to confidently perform the toughest car wash and detailing jobs. Purchase as many units of premium white hand towels at wholesale pricing online right away. We’ll ship your cotton towels to your business so you can start using them immediately. Car washing by hand is an art form that requires tons of old-fashioned “elbow grease.” However, you can maximize the time it takes for each vehicle to come through your car wash when you have reliable materials like cotton towels. What makes cotton the perfect solution for your car wash towel needs? Thirstiness. Cotton is an incredibly absorbent material. As soon as it comes in contact with moisture, it wicks it away. You’ll be surprised at how much liquid one wholesale white hand towel can absorb during a car wash session! Durability. Your towels need to keep up with the demands of a busy car wash, which is why cotton should be your go-to fabric. The premium cotton fibers in these wholesale hand towels are woven tightly together to increase functionality. Spend less over the course of a year by ordering economical towels that won’t let you down. Softness. If you’re working with towels all day, you want them to feel great on your skin. Cotton naturally has a fluffiness that keeps it from getting scratchy. The more you use these cotton hand towels, the softer they seem to become. Are you tired of constantly purchasing new hand towels for your car wash and detailing needs? Your high-volume facility deserves to have a reliable supply of towels that aren’t going to be thrown away after a few uses. Each cotton towel you buy from Towel Super Center is made to last. Plus, the more units of one dozen towels you buy at once, the less your per-towel price. It’s the easiest way to save money while building your brand. Order your preferred number of wholesale white hand towels made from premium cotton today. Want to keep your cotton towels looking great? Follow a few simple rules when laundering. First, be sure to wash your towels at the end of each day. This keeps them from holding on to stains or odors. Got grease on them? A pre-treatment product will help the fibers release residue in the washing machine. For best results, avoid using a liquid fabric softener. Softeners add a barrier against moisture, which reduces efficacy. Instead, fluff your hand towels in the dryer with dryer balls. Don’t have any? Clean tennis balls can also do the trick. Order your quality white hand towels at wholesale prices from Towel Super Center!